Cooker chicken with onions,haramasala, whole garam masala,salt,red chilli powder,ginger-garlic paste along with 2 cups of water for 10mins. Now take out the chicken and shread it,discard the bones.If you can, please take out the whole garam masala,specially the black pepper. To the gravy, that is left in the cooker,add cashewnut paste,shredded chicken and cook for around 5 minutes ...switch off the stove and keep this aside. Take a big vessel, heat about 2tbspns oil+2Tbspns of desi ghee and fry the oats to brown in colour...take care that you dont burn the oats. When the oats turn brown in colour immediately add atleast 3 glasses of water.Also add maggi chicken stock cubes. Now add the cooker ingredients to these fried oats.Add enough water so that,they both cook togther properly. Take a dal ghotni(one used to mash dal traditionally) and keep mashing the oats.Add black pepper powder abt 1tspn...or as per ur taste also add salt,coriander leaves,mint leaves,lemon juice,garam masala powder 1tspn.Keep frying all this for a while. If u find this difficult you can add some water,then simmer the flame and keep frying every now and then. Now take a seperate small utensil, heat about 4tbpns of desi ghee,to this add 4Tbspns of ginger garlic paste fry till it becomes brown in colour..mix this with the haleem/harees mixture..cook for sometime,the consistency should me medium thick..and switch off the flame.The harees should be not too runny nor too thick..as it will thicken up when it cools down. 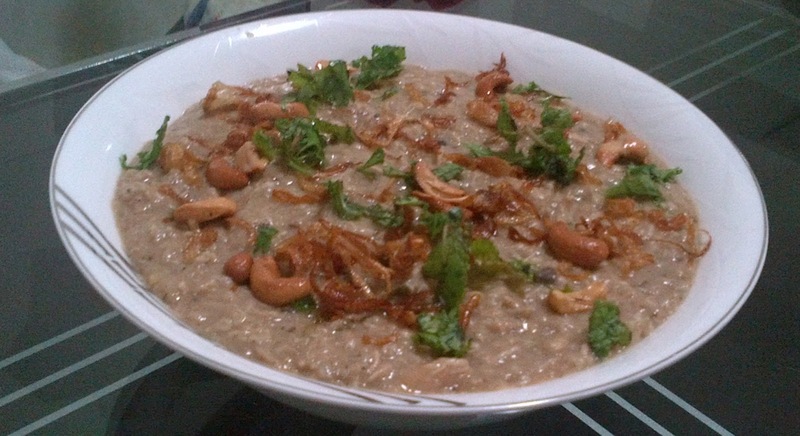 Garnish with fried onion,boiled eggs,coriander,mint leaves and fried caswetnuts. I always advocate for chicken gravy dishes. You have described it so nicely. I am expecting few breakfast recipes so that it will encourage our mornings. The original Harees is sweet. Sugar's drizzled on top. Ive so far tried your marag recipe and its a hit a home..Thank you so much. This time I wanted to try this Harees. Is there any substitute for chicken stock cubes? Good to hear that Marag was a hit. The substitute for chicken stock can be the water left out after boiling boned chicken preferably with mild spices , garlic and onion. 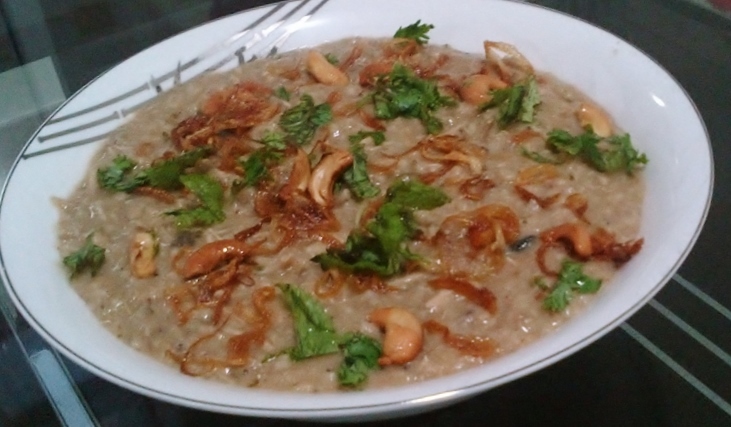 your chicken hares looks yum I want to try chicken hares and chicken dum biryani from your recipes. I saw garam masala as one of the ingredients in both recipes. could you please tell me briefly how to prepare the garam masala powder for both recipies. Put 4spn shazeera,4spn elaichi, 3spn patta,2spn loung,2spn kalimirch...roast all these ingredients in pan and dry roast them.then cool and grid them to a fine powder. I want to ask if I could use lamb instead of chicken ? I am glad you liked it. Never tried with lamb though,I use a traditional recipe if I am using lamb,haven't posted it yet inshallah will soon post it. Could u plz post the recipe before Friday as I need it for weekend party ! Shld v add all 5 onions mentioned in ingredients along with chicken in cooker ? Or is it for making brown onion fr garnish ? Plz reply fast as i need to make it today. The onions have to go in the cooker along with chicken!